Nine people are due in court next month following arrests at yesterday's protest at a Northumberland surface mine. 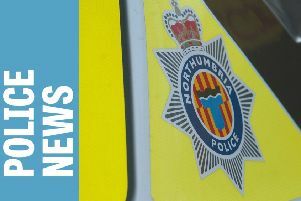 The nine have been charged with aggravated trespass and are due to appear at Mid and South East Northumberland Magistrates' Court, Bedlington, on Thursday, November 26. Protesters chained themselves to equipment and blockaded the entrance of the Shotton surface mine, which is operated by The Banks Group, as it is on land belonging to Viscount Matt Ridley – a prominent climate-change sceptic. Workers were unable to get into the site yesterday morning and operations were disrupted until the middle of the afternoon with the police making nine arrests. A banner stating ‘Keep it in the ground’ was held up at the entrance and other protesters were handcuffed to one another with their arms in drainage pipes. They were also urging people to support the Save Druridge Group. It is opposing Banks’ planning application for opencast operations at the Highthorn site – land to the north of the C116 which runs between the villages of Widdrington and Druridge.